July 24, 2018 By Paula 3 Comments This post may contain affiliate links. I’ve written a few posts lately about Pinterest because that is where we are placing most of our focus at the moment, at least in terms of traffic generating techniques. To be honest, we are kicking ourselves for not focusing on it sooner. It has generated massive amounts of traffic for us in just a short period of time so it’s well worth it for something that is so easy to implement. We started our craft site back in 2014 and started a Pinterest account that same year. Our Pinterest strategy (if you can call it that) was to just pin our own content and only when we had something to pin. For example, if we created a new YouTube video or blog post, we would create a pin. In other words, we were pinning just our own content to Pinterest and it was sporadic to say the list. Maybe 2 or 3 pins a months, if we even actually remembered to pin something. As you can expect, this really didn’t result in much of any traffic. Maybe 1 or 2 people a day if we were lucky. As time went on we started to get into better habits and made sure we pinned everything we created. Even so, we only pinned directly from our website or our YouTube channel using whatever image was on the page at the time. In other words, we didn’t make any effort to create our own pins even though everyone was recommending making nice tall pins. Plus, we were still only pinning our own content. (I’ll get into this a little more further on, about the need (or maybe not the need) to pin other peoples content. Surprisingly our traffic increased despite the lack of real effort. We were getting around 30 to 60 visitors a day to our site from Pinterest. However, that is where it sat, with the odd traffic spike here or there, until early 2018. It wasn’t until January 2018 that we started to see what Pinterest could do for us. It was just after Christmas and quiet because of the time of year, so I thought I would work on creating some Pinterest pins. The only reason I did was to test out the tall pin theory. We had only been pinning square or rectangular images. I went ahead and created around 10 pins. You can see the results here but let’s just say, it was a resounding success. 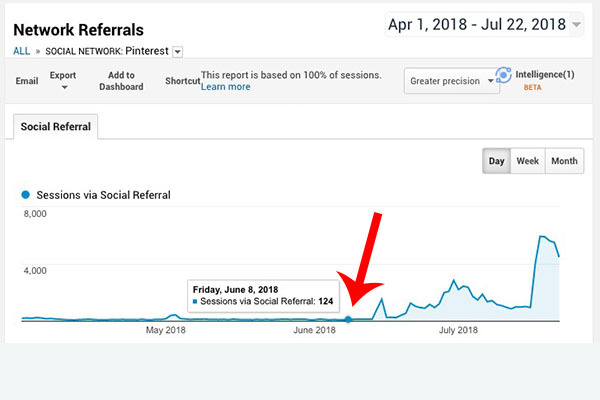 We received over 7000 visitors from Pinterest in that same week and the traffic continued to flow in until about the middle of January and then it peaked off. However, despite the fact that the traffic dropped, it never went back to our 2017 stats of around 30 to 60 visitors a day. Now we were receiving over 100 visitors a day and it remained fairly static. 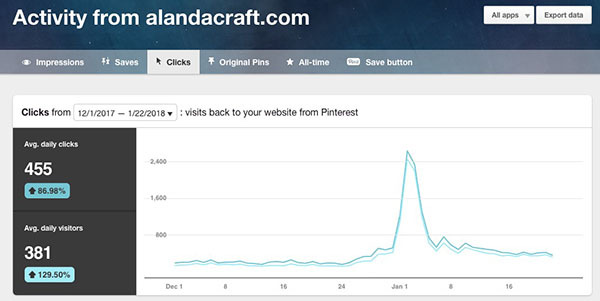 You can see in the image below the spike in the number of clicks to our website from Pinterest in January. Now, you would think that if you suddenly started receiving thousands of new visitors to your site from such a simple process, you would start to work on it and get it going fast. Yeah, you’d think that but that’s not what happened. Despite the big jump in traffic, we STILL DIDN’T TAKE ACTION. I only created those 10 pins and then we went back to our same old habit of only pinning when we had something new to pin, albeit, we were at least pinning using the new longer pin. Even though we didn’t take immediate action at the time, the January Pinterest thing was still in the back of our minds. Plus, we kept seeing blog posts from people saying how they had massive increases in traffic in a matter of months using Pinterest. We knew that now was the time, so we started researching everything we could on the subject and we started pinning. However, it was slow going. We knew we needed to get the numbers out there if we were to succeed. Pinning just every now and then wasn’t going to cut it. We signed up with Canva so that we could get more pins done more quickly, although to be quite honest, we are using mostly Photoshop now. It’s just a lot quicker for us but that’s another story. Even so, it was a bit overwhelming and it just wasn’t flowing for us. We needed something to speed up the process and lessen the time we had to spend working on it all. Plus, it needed to be something with a bit of structure so we could keep track of everything. Since we had been researching Pinterest strategies, we had seen time and time again, people recommending using a scheduler to speed up the process and most recommended Tailwind. Now, we have been in the blogging game for a lot of years now, so we know that just because someone recommends something, it doesn’t mean that they actually use the thing but most seemed quite sincere and since we could try it ourselves for free, we decided to take the plunge. It also helped that we knew that Tailwind is actually a Pinterest partner. To me this means that Tailwind wouldn’t do anything that isn’t allowed by Pinterest, so we wouldn’t have a problem with our account being banned. On 12 May 2018, we signed up to give it a go. Our only problem was the free trial only allowed for 100 pins. It is a free trial after all. With this in mind, we decided to just pin once a day with Tailwind for 30 days to get the hang of it and see whether it was something that would help us. We also pinned a few pins manually. It was about 45 pins in total and still only our own content. As we got closer to the end of the trial, we knew that Tailwind was what we needed to make our life a whole lot easier. On 8 June 2018, we upgraded to the full version. This was it…time for the big guns!! Now that we could pin as many pins as we liked, we went for it. Our goal was to pin no less than 5 pins a day of our own content. We had a ton of tutorials on our site so we could easily do this using the strategy that we went with. With Tailwind, you can schedule content to go up at any time day or night. This is great for us, since although we live in Australia, the majority of our audience is in the US. Plus, it means we don’t have to be constantly on Pinterest manually pinning at different times of the day. You can also schedule one pin to go up on multiple boards (and group boards) over a period of time. So for example, you can schedule a pin to go up on Board 1 today, Board 2 next week, Board 3 the week after and so on. And it doesn’t have to be a weekly interval, it can be whatever you like – so every 6 days or every 20 days or whatever. Tailwind also allows us to schedule pins to Facebook…bonus!! This is what we were after so we were extremely happy that we went with the paid version. So, here’s the important stuff. Has it been worth it in terms of traffic to our site? The answer to that would be a resounding YES! Here’s some awesome stats for you. The first image is the Google Analytics stats from April 1 to July 22. This is purely the traffic from Pinterest to our craft site. The arrow is pointing to June 8 which is when we purchased Tailwind. You can see that about 5 days later, there is an almost immediate jump in traffic. We went from around 150 visitors a day to over 1500 a day IN JUST 5 DAYS!! It dipped back down again but then a few days later it spiked again, dipped a little, then spiked again. You can also see a massive spike at the end there. That one was for July 17. This resulted in over 5000 visitors to the site in one day from Pinterest. You can see it is starting to dip again. Again you can see the big spike again for July 17 which corresponds with the Google stats above. UPDATE 30 September 2018: Here’s another update to show the progression. This is for the period 1 April 2018 to 28 September 2018. UPDATE 2 December 2018: One more update. This is for the period 1 April 2018 to 2 December 2018.) Note that we haven’t been pinning as regularly as we have had other priorities but when our schedule opens up again we will be going back to doing a couple of weeks of solid scheduling of pins. Nevertheless, the traffic from Pinterest has remained fairly steady. UPDATE 16 February 2019: Another update for the start of the new year. We have done another round of pinning (although it wasn’t a massive amount) since the last update. You can see a jump as a result of this. We have scheduled in another full week of Pinterest for next week so it will be interesting to see how that goes. Because we had such a dramatic increase in traffic we decided to add Adsense to the site in late June since many of the pages weren’t monetized in any way. It was a great success and we very quickly covered the cost of Tailwind for the year PLUS an upgrade to Tailwind Tribes which we just purchased. How Much Time Did We Spend in Tailwind? The beauty of Tailwind means that you don’t have to work on Pinterest every single day. So we spent about a week solid working on getting as many pins as we could get up onto Tailwind. Because of this, we have a minimum of 5 of our own pins going up each day all the way up until January 2019. Now, you might be asking how we managed to have so many pins. You have to remember that with Tailwind you can schedule the same pin to go up on multiple boards (and group boards) over a period of time. So the same pin is being repeated sometimes up to 10 times on different boards over an extended period. Plus, for a lot of the pins, we created 2 or 3 different versions. So they link to the same page on our site but they use different images as the pin. So essentially we don’t have to touch Tailwind or Pinterest again until next year. It’s all done for us! However, since we still have plenty of pins we can create and we don’t want the same pins being repeated ad naseam, we have been devoting one day each week to creating new pins. It’s definitely worth it for the amount of traffic we are getting. Are We Pinning Other People’s Content? This may be a bit controversial but what we have found is that you don’t have to pin other people’s content. You can just pin your own and be just as successful. We only started pinning other people’s content just recently and it was few and far between. Just to fill a few gaps in the Tailwind schedule. So I don’t believe you need to pin other people’s stuff to be successful on Pinterest. However, having said that, if you want to be successful with group boards or Tailwind Tribes, then you need to do the right thing and help by pinning other people’s pins. This is especially so for Tailwind Tribes. We have just upgraded to a Tailwind Tribes pack and it’s an absolute must that for each pin of your own that you add, you need to pin at least one other person’s pin to a Pinterest board you own. So for us now, we are starting to pin a lot more content from others. What we have learned is that you don’t need followers to be successful on Pinterest. We only had around 2800 or so when we started with Tailwind. Can’t remember the exact amount but we seemed to be in that 2000 range since forever. We now have just over 3600. So in just a month and a half we had an increase of around 800 or so followers. So a really nice increase but as I said, you don’t need loads of followers to make it with Pinterest. 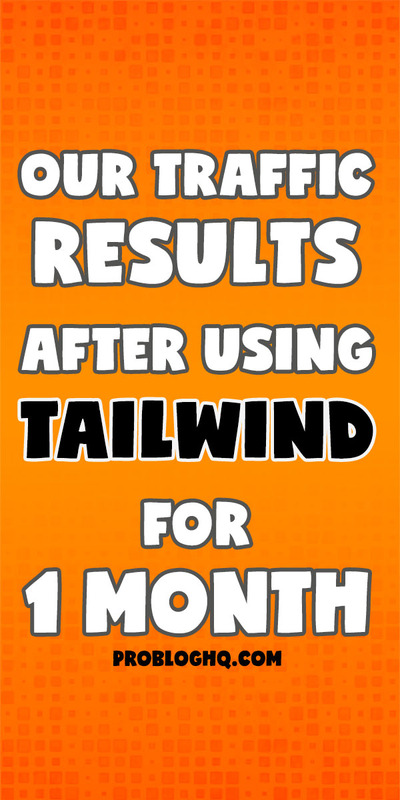 Are You Ready to Give Tailwind a Go? You can sign up to a free trial with Tailwind which will allow you to schedule 30 pins to post to Pinterest. We did this to ensure that it was going to be useful for us. We ended up purchasing the paid version which allows for unlimited pins. I’ve read the whole article as I’m really amazed on the results you have achieved for your website. I’ll definitely check the tool out as I’ve just launched a new website that I think can benefit from Pinterest platform. Awesome results! and thanks for sharing the myths about followers, pinning other people’s content, etc. Glad I could help Vinson. And you don’t need Tailwind to make this work but it sure does help. It just speeds things up a quite a bit.